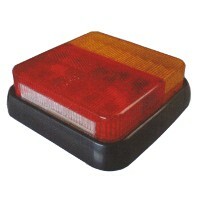 A 10 - 30 volt universal rear light cluster with side, brake, indicator, reflex reflector & number plate functions. It has a polycarbonate red, amber and clear lens and a base of ABS plastic. This unit is ideal for trailer boards. The amber section has 27 LEDs, the red section 18 LEDs and the clear section 5 LEDs. The red section also incorporates a reflex reflector. The wires enter at the rear where the circuit board is encapsulated in epoxy resin. It has a current draw of 600mA across all voltages.